It was almost forgivable when caddy Steve Williams lost the plot last August, letting his emotions get the better of him in the aftermath of new boss Adam Scott’s impressive victory at the WGC Bridgestone Invitational. Williams was viewed by many to be an idiot after his initial outburst in late summer. And now, as early summer hits the Antipodes, he has been roundly castigated for his latest comment - and this one is indefensible. The digital age has now made it ridiculously easy to reveal information in an instant. So you can only imagine the urge felt by many in attendance at the HSBC Caddy of the Year Awards in China to divulge “Stevie’s” latest faux pas. The caddying fraternity are a ragtaggle bunch of nomadic vagabonds, and given the precarious nature of the job, their skin is very much of the thick variety. Williams, by far the most successful of them all, should know better - but clearly doesn’t. It is true that these awards are a tongue-in-cheek affair and the banter quite merciless. Throw in a generous sponsor, an opulent setting, an invitation-only mix of players, bagmen and various insiders, and the concoction mirrors that of a stag party. Hence the demand that all comments made inside the room were off the record. In this day and age, that’s impossible. Quick to apologize having initially been taken aback that many British broadsheets had chosen to report the incident, Williams stated on his website: "Players and caddies look forward to this evening all year and the spirit is always joking and fun.” He went on: "I now realize how my comments could be construed as racist. However, I assure you that was not my intent. I sincerely apologize to Tiger and anyone else I have offended." Unsurprisingly, Woods' agent Mark Steinberg also issued a statement. "We got multiple calls from people who sounded like they were leaving the caddy party," Steinberg said. "Tiger obviously wasn't there. He doesn't know exactly what was said. But if multiple reports - which all seem to be accurate - are true, then it's sad it's come down to this. It's a regrettable comment, and there's really nothing that Tiger can do or say. He's just going to move on." With a round to go at the final World Golf Championship event of the year, Scott has also been forced to state his position. Despite widespread calls to ditch his caddy ahead of the upcoming Australian Open and Presidents Cup, the world No. 8 has stated that he is standing by his bagman. PGA Tour executive Ty Votaw stated on Saturday: “We'll have no comment publicly on this matter. The tour has the ability to discipline caddies of its members.” But Votaw, a lawyer, said later that "the fact that we don't have a comment at this time doesn't mean we'll not have one in future." Ahead of a massively important two weeks for golf Down Under, with Woods and other big international names in town for the Australian Open and then the Presidents Cup, the focus has suddenly been diverted and the game certainly deserves better. The old saying is, “What goes on tour ... stays on tour.” But only an idiotic fool could believe that to be the case now. I lost millions as a result of being fired by TWs and what can you expect me to say? That jurk LaCa.. is taking it from me. He is gonna laugh at me and TWs is going to win more majors in 2012 and me with Scott so far got 50, 000 dollars? I am bitter and will remain bitter with the rest of my life I know it. You better punish me before I turn everything upside down on this man before he conquer history. 3) No he should not be fired. Harden up, princess. The Politically Correct will ruin the world. Your foul mouthed caddie Steven Williams has overstepped the mark again with his racist remarks...you should publicly say that you do not condone such remarks or better still....sack the Kiwi.... Adam, you don't need a caddie like this after all it is you who does the work. As a Mooloolaba fan of you and Tiger I expect you to be a good sport and maintain hgh ethical standards on and off the course. Isn't being thick-headed AND arrogant enough punishment? This intemperate bogan would be a no-name if he hadn't had the opportunity to caddy for Woods and he was paid millions of dollars for his trouble, essentially for being a glorified porter. As to whether he should be punished, absolutely. It's all too easy to make offensive comments and then hide behind the lame, whiny "sorry, just joking". That's what all these chortling bigots do. And as for Adam Scott's response, it was telling – seems like he and Williams deserve each other. This low life is a racist. Had it not been of his being under Tiger for several years , his worth is no better than a social welfare beneficiary here in New Zealand. He just forget who he was before. Shame on him. He's a great caddy, but being a millionaire makes him think he's one of the stars. Zip it Steve – you're bad for the game. Stevie says what we all want to say but don't say in public. Unfortunately the journalism microscope these days is very strong and every comment is scrutinised. Stevie, keep on being the true yourself. There is no doubt in my mind that this Caddie is quite out of line, it is a pitty that the World Golf Organisation, is not able to disqualify him and impose a very hefty fine. Until all development in Australia, NZ, Canada, the US dismantled and brought back to Europe, all the environmental destruction for the past 3 centuries repaired and all the human exploitation for the past 3 centuries reversed, no, politically correctness excuse is not the right excuse. White privilege is just a remnant of white hegemony that is long gone since the mid 1980s. Just feel lucky that you are able to do as you please with impunity considering the cultural and racial karma in today's world. For years I have watched as Tiger virtually 'walked on water' and was a GOD like figure to every man,woman and unfortunately,child(on our seemingly small world compared to Tigers).To have that kind of status is of immense honour,priviledge and an enormous amount of expectation.But that comes with the territory and you can look to others who have been their like Jack "The Greatest Player Of All Time"Nicholas who not only one the most majors(18) but had the integrity and respect for what he stood for and to know that millions upon millions of kids(like Tiger was for instance) around the world will look up to him.What a roll model!Tiger get's paid wether he wins or not and is endorsed to the billions by sponsors who feed off him so the average person go to these sponsors products pure and simply because Tiger endorses them!How insane is that.Steve Williams vents alittle steam be it immature,Tiger does not lose anything but a bruised EGO.Get over it TIGER you can certainly have the last laugh IF you can pull off the 18 majors or more in your career and live a long and fruitful life that was only drilled in you from the one and only person responsible for you being where you are today,your Dad.I rest my case. Whether this comment was made about Tiger Woods or any other pro, it was inappropriate. In the sports world, there has to be standards, rules, and punishments. Therefore, yes, there should be a punishment. As a black man I take offense to Steve's comments, he has insulted not only Tiger but us all as a black race. He needs to give a formal apology to all including Tiger for his racist remarks. The PGA needs to do something about this or they will be looked as condoning his remarks. Who the hell is Steve Williams to make such remarks? This was in a closed party, so what's the big deal? Woods fired him. If Woods was a woman, the caddy would be making sexist remarks. Does that mean he is racist or sexist? No, it means he was dismissed and he's doing what any disgruntle former employee would do. Rather than punishing the caddy, employers should be lectured oh how to treat your employees. I think people are making too much of what he said. He should have been more careful, but honestly, we say stuff like that all the time when we're just messin around. When you're with people you know, you unfilter yourself sometimes and say stupid stuff but that doesn't mean he's a racist or meant it in anyway. It ain't like when Kramer (michael richards) went off. He has made 'mistakes' again and again. May be its in his DNA. Just throw him out of Golf. He will learn to respect fellow beings. Tiger should ask the USPGA to dismantle the Adams/William union. i wonder how important is a caddies role in any golfer's success..this caddy thinks its very important and he in fact was responsible for tiger woods success. what if all the golfers decided not to hire him. what would he be doing. Well, Steve you are not so bright. Instead of been diplomatic and say something like "we all make mistakes" you opened your trap to tell us how clever you are. Shame on you. The man Tiger made you to be the best caddy in the world. It was not the other way around. You would be nothing without a player like that. He was right to be cross, and when he needed a friend you cast stones at him. I thing you are arrogant and stupid. Nobody needs a caddy like that. This is going to far. He did not use any N word. Tiger is black, I am white that is a fact, not racism, and if someone considers i am an a**hole, well then, yes, i am a white a**hole. This is not a racist slur, it is a statement on which one can agree or disagree. To consider calling some body black is an offence actually IS racist as it infers that being black is something negative. So let us stop beig paranoid about racism! When did this become the soviet union? He said uttered a political faux pas... Shall we send him to the gulag? Only in America could they get worked up over something like this! Grow up USA ! Why did you delete my comment CNN? Didn't it fit with your unbalanced and biased method of reporting? You are supposed to report stories in and fair and balanced manner which reflects all points of view. The point I made was that it is only in the US that anyone would worry about something as stupid as this. Do you really think this is worthy of headline news? He deserve punishment,to demonstrate the spirit of sportmanship not only that but the need to punish such unguided comment ,racist comment from happening again,This old ungrateful idiot should be banned and fined to set a straight example for those who may follow suit in race abuse in sport. What an idiot, you should not bite the finger that fed you, who was Steve Williams before he started caddying for Tiger? He has made comments about other stars in the past, I think it is time to shut the idiot up once and for all. Of course the guy needs to be punished. He didn't make the comment or statement in the arena of his home or personal life. The degrading comment was made within the professional golf world and shouldn't be tolerated. "Everything in that room last night was all in good spirits and a bit of fun..." Is that so...I am sure Mr. Woods did not think that. I do not think that either. Racist comments like that cannot be treated as fun at the expense of someone else. Come on GROW UP, we now live in the 21st century, we cannot have fun with racial remarks. One can no longer just say 'Oh! it was just a joke, bit of fun yeah, yeah, yeah..." I would imagine this can happen in a KKK's dinner party but not amongst the respectable (except Mr. Scott and Mr. Williams) golfing professionals. Sporting events on and off the field must show zero tolerance. Take a leaf out of English Premier League where zero tolerance policy exists for football professionals as well as for fans. The world of golf should not tolerate such an un-gentlement behavior, after all golf is a gentlemen's game. Adam Scott should reconsider his decision to hire him as his caddie. Shame on you S. Williams. Tiger wronged what two dozen women plus his wife? Well, make it a hundred because of his victims' relatives. Stevie wronged the whole bunch of the black nation. Stevie, tone down that vitriol it will do you no good. Let bygones be bygones. Sure, Tiger would invite you for a beer when he wins the Australian Open. Steve Williams racist and bigotted comments, reveal the shallowness of his character and the poverty of his brain. I have seen more class in a sack of wet fish. He makes one ill-chosen comment and people freak out? Give me a break. If the guy was racist then would he have worked with him for so long, even before he was really big? For all the good he's done and the charities he's set up, you want to lynch him for this? You've never made a stupid comment before right? Relax people. Who said NZ is not racist? There is a large undercurrent of blatant racism in New Zealand. Employers blatantly discriminate and if you ask any minority directly, they would think you are living in lalaland if you honestly believe NZ is a country of respect for other people. I am NOT A KIWI. But they are the most generous people who embrace diversity and stand for principles when the rest of the world does not. They are very civilized and very nice people who stand up for things that is right whether it comes to good environment, stop whaling and dont invade countries for oil in the name of democracy or defeating terrorism. For all those lovely people this guy is an utter disgrace. They should not say he is a Kiwi cos Kiwis are good like the Kiwi birds!!. Scott should fire Mr. Williams and an agreement amongst gentlemen not to hire him in any other camp should end this sad story..
Can somebody tell me where does one see racist context in that sentence he said ? Since when color recognition is considered as racial ? Did he pointed out that "black" people are less than white? Did he ? No! So what – if somebody tells me I'm white trash, should I cry he made racist comment or what? Oops – he stated the obvious – I'm white (as Tiger is black). I'm tired how people are always trying to find racism everywhere. Simple put: it doesn't matter what color you are – people are equally stupid all over the world. p.s. I'm not saying what he said was OK, but it was not racial – that's the difference. It is impressive. Wood's screws who knows how many women, and now Wood's is screwed, verbally by his ex-caddy. Seem's like the Ex's in Wood's life have a lot to say. Clearly this IDIOT is still hurt after being fired by Tiger Woods. He must surely be punished. If Tiger Woods had made any such comment the whole world would be after him now. Corporations that support the PGA should be outraged and should stop supporting the PGA as well as anyone associated with Steve Williams until a fine, suspension, and any other punishment can be levied against Steve Williams for his racial comments. That Tiger was the focus of so many of the comments above says a lot about you. The issue isn't the that there is vulgarity in it, and Tiger himself is not even the one complaining. So this is not a case of Tiger himself "being soft". The issue is that the comments suggest that being black is a negative characteristic. He didn't call him a rich a**hole. He didn't call him an adulterous a**hole. He didn't even call him a bi-racial a**hole. The idea wasn't to be factual or descriptive. It was to be disparaging. The intent was clearly to make a compound of disparaging characteristics, and, one of those 'disparaging' characteristics was that he is 'black. The comment was a window into his view of blacks, and he cleary wasn't portraying blackness as a virtue or an asset. It was an involuntary confession. Tiger has been called much worse in his life. It's not about the severity of his language. Thatbwas mild by today's standards. It's what the comments say about his view of blacks far beyond just Tiger himself. Just call him a idiot and move on. 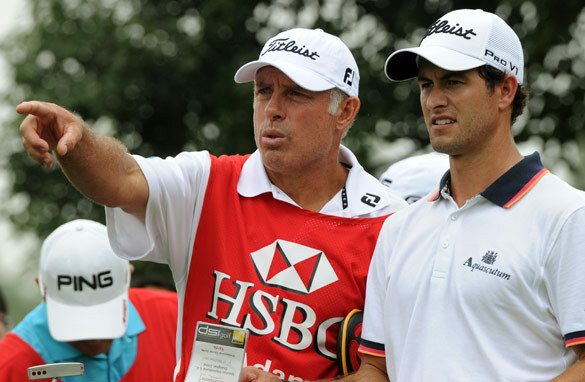 Steve Williams new boss Adam Scott’s seems to have inferior complex to allow his caddy to insult tiger woods. I dont agree with what he said. But, Woods is indeed black, isnt he? Punish Steve Williams for what?!! Folks that want to punish Steve should grow some stones or start wearing dresses...what ever does it for them. Shane, if it is true that only an idiot would believe that what happens on tour stays on tour, there must be a lot of idiots on the PGA tour, both players and caddie's. Because Tiger's frequent hanky panky was frequently and widely discussed, but still took a decade to come out. Racist comments are utterly unacceptable, so should adultery be. Will the PGA now act against one form of unacceptable behavior and quietly condone the other? Williams comments show him to be the money grubbing NZ that he is, whining about how many millions he's lost.If it wasn't for Tiger's brilliance as a golfer he'd have earned peanuts. So he should shut up be thankful he latched on to Tiger and Adam Scott, when he did.There's heaps of caddie's as good or better than williams. I consider myself a super liberal and find Williams' racial "joking" in public to be questionable indeed. But I also think political correctness can be taken too far and result in everyone taking themselves too seriously. Assuming reports are accurate – that the atmosphere at the event is traditionally irreverent – I don't think Williams should be punished or fired for his jab. I am afraid I don't understand some of the comments published here (English should be made compulsory !! ), but I do get the impression that a few people are missing the point. The issue here is not whether it is alright to "have a go" at Tiger Woods for sacking him (Williams) and being unfaithful to his wife. No, it is the racial implication of the language used. The next thing you know, someone will be attacking your President using similar language, for getting health care to under privileged people. Mr. Williams, you have crossed the line. Again. Stand up like a man and take it. As much as TW has done wrong things, whatever is between you and him has remained confidential. As it should be. You however want to continue to publicly rant and defame someone and then think there shouldnt be a consequence? Get over yourself. It is a very sad and telling indictment that Steve Williams could work for TW for so many years and in a moment when he thought he wasn't being watched, let rip with his real feelings. I would not have minded had Williams called TW any other derogatory term, but to pick on his colour is RACIST, by definition. And shame on the US and European PGA for failing to censure Williams for a comment that is hurtful to a person of colour- a comment that I as a coloured person find totally unacceptable. Its funny how people say racist statements and say sorry after. I see some are saying he is saying something that we all think but are scared to say, why on earth did he not only say " you As"""hole" ? why did he have to include the world black? White people are privileged to say a lot of racist rubbish and get our way with it. One day that will all end. There is a lot of hatred in the world and you all surprisingly wonder where its coming from, such " jokingly" statements. Leaving in New Zealand i am not surprised with Stevie's statements. I long ago realised that sports stars are not role models and should not be considerd as such. They are great at their respective sports and should not be expected to be extemporary or even "normal" in other elements. Their helpers (cadides) are certainly not either! So when will these so called civilised people know that it is bad enough to insult someone to start with when get carrried away with anger let alone use skin colour in the process? Isn't it strange that, these same people, when they get caught out turn around and say they do not mean to be racist? Its a shame that some people think they are clever than the creator who in His great wisdom created some Africans, some Europeans, some Chinese and so on and so forth. Evil/satan has managed over the years to convince supposedly sane men to question the God the creators wisdom. It is sad that even in 21century world people walk around upholding the devils agenda of looking down on another group of people. We will have to answer for ourselves someday. What a weak pathetic person you are Williams. Ungrateful, bitter, and no self-control. You traded character and integrity for pride. Good ridence. The bible says that what comes out of our mouths is what's being stored in our hearts. Steve, I don't believe you are truly sorry eventhough you said you were. What you need is Jesus in your heart and He will clean out all the filth that is in your heart. Yes I think what Williams said is racist, and yes I think Adam Scott should have the intestinal fortitude to fire him, but I'm also a little incredulous that anyone should care what Williams or any other caddy has to say. When Lionel Messi scores a great goal you don't credit the boot boy do you? As far as I know, Barcelona's kit man doesn't give post-match interviews does he? So why are the words of a caddy of any interest at all? They are bag carriers, porters, bell boys - each an honest profession I might add, but not usually looked upon as keynote speakers! Williams might suggest to his employer which club to use or advise him on distances and the like but he doesn't PLAY the shot he WATCHES his man play the shot, much like the rest of the gallery or tv audience, the better informed of whom might have enough insight into the game to offer the same suggestions. Sure, great performances are a combination of careful thought and execution but I'm certain elite athletes need at least a modicum of sporting intelligence to reach the top, and, in any case, the execution is by far the most important part of the equation. That's provided by the player not the bag men the last time I looked. Williams is a glorified laborer, a golf cart on legs with an overblown sense of self-importance. He's also vindictive, ungrateful, and, judging by his recent comments, a closet racist. All very sad and morally reprehensible but he's only a BAGMAN. Sack him, forget him, and move on because he just doesn't matter! The PGA will do nothing about this, at all. let's not forget, they (PGA)hate TW. This mixed kids came and took the lilly white sport out of their hands. Hell! until TW, blacks and other minorities, were not allowed in most golf clubs! Get on with life fokes, who cares men say this s...t all the time, to and about each other, play the game. Who really wants to take credit for reporting, school boy talk. If tennis superstar Serena Williams could be fined for her outburst at the US Open two seasons ago, caddie Williams deserves as much for his caddish comment about Tiger Woods.No free pardons for inexcusable behavior. Just as simple as that. He made a point to mention Tiger was black, so of course he has a problem with black people, and likely some sort of built up resentment over Tiger being a gifted black golfer. I can only imagine how he carries on when there isn't media present. Punishment? I don't know, but Williams is classless. Williams looks thick and sounds thick and that probably is why Woods fired him. You simply can't afford to have a thick and ignorant racist caddy to bungle up things for you, if you are determined to win, can you? Judging by the way his new employer came to this idiot's defence, he is also thick: Dumb and Dumber perhaps? Just read Adam Scott's comments on Williams' alleged racism. Talk about evading the issue. He said nothing! But do his actions speak louder than his words? As far as I'm concerned he paid lip-service to condemning racism but then endorsed an apparent racist by keeping him on his team. Racism will never be eradicated from sport until those with the power to make a stand get off the fence. Racism is not "unfortunate", as Scott described it, it's ignorant and bigoted, and if he really believes "we don't need that in the game" then he should have fired Williams with no hesitation. Clearly he doesn't have the desire and/or the fortitude to do so, and his dodging of the issue does him no credit. Though in fairness he shouldn't even be in the position of having to make a decision, because if the governing bodies of golf do have a zero tolerance policy towards racism they should step up to the plate and ban Williams themselves or risk seeing their anti-racist stance unmasked as empty rhetoric. His 15 mins of fame passed away long time ago, time to fade away. What a feeling of self importance, thinks he's the star in this sport. Tiger made a name for him, and countless millions. What an ungrateful, pathetic moron, and utterly classless. Steve time to come back to earth, and shut the hell up. Nobody watches golf to see you carry clubs. You should thank God everynight for being Tiger's caddy for so long! The comment was rude and disrespectful..not racist. Williams has apologised to Woods and Woods has gracefully accepted the apology. End of story. last comment he made was racist, why mention "black a**hole", he was definitely disrepecting tigers race when he drew emphasis on color of skin. Please, can the world focus on something other than a stupid off-the-cuff remark at a stupid closed party. Maybe next time some idiot reporter will see some drunk acting like an idiot at a bachelor party and report on the sexist behavior being exhibited. Or maybe some adult in a high government position acting like a moron talking gibberish at a 2 year-old birthday party and suddenly have their sanity questioned. Please. Steve Williams the "International Idiot Kiwi"(IIK ...lets all now refer to him as THE IIK........Lets have a IIK Day to help him feel good about the peanut in is brain...has he got one. Im looking forward to the next major tournament...FACEBOOK..fans..lets launch IIK....to fight racism. Mr IIK ...do hope your wife and kids read this...Have you hidden anything from your wife?